Although it’s barely spring… it’s already heating up and swim season is here. Along with the long, hot swim season in Arizona, comes the unfortunate reality that some children are left unsupervised around water. Arizona is ranked 2nd in the nation for drownings of children under 5 years old. Another staggering statistic? Drowning is the number one injury-related cause of death for children under 5 in Arizona. At the time of publishing… 4 Valley children were found drowned in pools. Two of these drownings were fatal. On March 25th, the Valley united for the 15th Annual Water Safety Day. 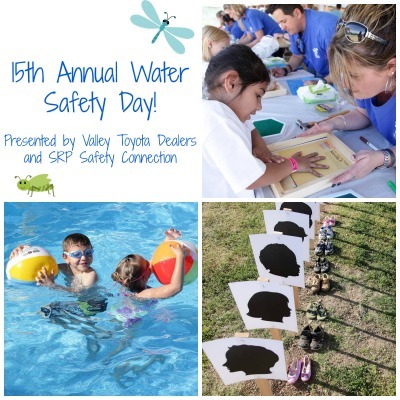 Water Safety Day is made possible by Valley Toyota Dealers and SRP Safety Connection. This unique event is organized by Water Watchers, a Phoenix Children’s Hospital advocacy and prevention group. Mesa Fire and Medical Department along with Mesa Community College will hosed the event by providing support and assistance onsite. Nearly 1,100 first grade students attending as part of a seven-week learning process, including a special curriculum. This one-of-a-kind celebration included live rescue demonstrations, swim and safety lessons in a huge heated pool, crafty workshops to create safety reminders, singing fireman, a puppet show, and a kid-zone carnival area. The whole purpose of the event is to share evidence-based prevention messages to Valley families. Strong visuals, fun activities, and a special school curriculum really help to drive home these important water safety messages. Disclosure: This post was written simply as a community service announcement and I was not compensated to share it. Thanks for reading!